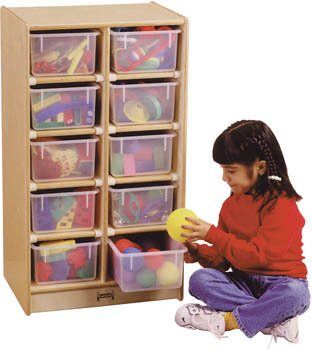 We offer storage units that are perfect for storing toys, craft supplies and other play items. Units come in mobile, stationary and foldable/lockable options. Many units also available with or without storage trays. Construction includes Birch hardwoods and Melamine Laminate. 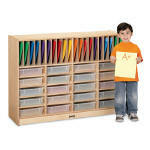 For more storage options for Art and Paper Supplies go to Easels and Art Supply Storage. * All JC Coded items are Birch construction. Some Products with JC Codes available in Rainbow trimmed gray freckled melamine with a choice of six colors. Additional charge applies. **For even more product options, many of the JC Codes are available with back options as noted. All backs are recessed to enhance the strength and appearance. Back Options if offered include write 'n wipe, chalk, plywood, flannel, acrylic mirror, pegboard, clear plexiglass and magnetic. Click on the list to view Specific Product Selection and Pricing or Scroll the Page to view entire selection. 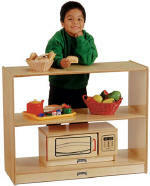 Three shelves for cubbie trays at childrens' height. 28½" wide x 15" deep x 24" high. Stationary. Birch construction. Cubbie-tray colors are red, blue, yellow, green or orange. Lifetime Warranty - Birch Construction. Back and Rainbow options not available. Utilize valuable corner space. Engineered to mix-or-match storage shelves. Three heights available. 15" wide x 15" deep. Stationary. Easy to Assemble. Lifetime Warranty - Birch Construction. Perfect for block play! Compartments for three See-n-Wheel bins, included, in stationary shelving. Baltic Birch back only. 48" wide x 18" deep x 28½" high. Lifetime Warranty - Birch Construction. Control classroom clutter on these long broad stationary shelves. 48" wide x 15" deep x 42" high. Back options available. Mobile, caster mounted. Lifetime warranty - Birch Construction. Great for books or unit blocks. 24" wide x 15" deep x 35½" high. Back options available. Mobile, caster mounted. Lifetime warranty - Birch Construction. Eliminate classroom clutter. 36" wide x 15" deep x 35½" high. Back options available. Mobile, caster mounted. Lifetime warranty - Birch Construction. Our largest single storage unit. 48" wide x 15" deep x 42" high. Back options available. Mobile, caster mounted. Lifetime warranty - Birch Construction. 6324JC TODDLER CORNER STORAGE 24 1/2"
6392JC LOW CORNER STORAGE 29 1/2"
6691JC SUPER-SIZED CORNER STORAGE 35 1/2"
Create a room divider or utilize valuable corner storage space. Engineered for use with standard 15" deep storage units. Three heights available. Plywood back only. 30" wide x 15" deep. Mobile, caster mounted. Lifetime Warranty - Birch Construction or Rainbow option available. 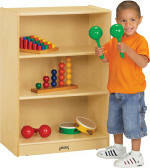 Perfect for nursery and daycare use. 48" wide x 15" deep x 24½" high. Back options available. Mobile, caster mounted. Lifetime warranty - Birch Construction or Rainbow Option. Unassembled Unit has hardwood back only and 1 year warranty. Designed with smaller children in mind. Can hold a 340 piece set of unit blocks. 48" wide x 15" deep x 29½" high. Back options available. Mobile, caster mounted. Lifetime warranty - Birch Construction or Rainbow Option. Unassembled Unit has hardwood back only and 1 year warranty. General purpose storage unit. 48" wide x 15" deep x 35½" high. Back options available. Mobile, caster mounted. Lifetime warranty - Birch Construction or Rainbow Option. Unassembled Unit has hardwood back only and 1 year warranty. A two-inch lip around the top to keep supplies off the floor. Two adjustable shelves. 48" wide x 15" deep x 35½" high. Back options available. Mobile, caster mounted. Lifetime warranty - Birch Construction. Click here for full selection of Book Shelf furniture. Roomy fixed shelves for storing large objects. 48" wide x 15" deep x 29½" high. Back options available. Mobile, caster mounted. Lifetime warranty - Birch Construction. Click here for full selection of Book Shelf furniture. Storage designed for kids. One adjustable shelf. 48" wide x 15" deep x 29" high. Back options available. Mobile, caster mounted. Lifetime warranty - Birch Construction. Click here for full selection of Book Shelf furniture. Two adjustable shelves make storing books, games and puzzles a snap. 48" wide x 15" deep x 35½" high. Back options available. Mobile, caster mounted. Lifetime warranty - Birch Construction. Click here for full selection of Book Shelf furniture. Specially designed for daycare centers. Cubbie openings are 13½" wide x 14" deep x 10" high. Overall 57½" wide x 15" deep x 35½" high. Back options available. Mobile, caster mounted. Standard tub colors are red, blue, yellow, green or orange. Lifetime warranty - Birch Construction. Ideal for small classrooms or limited space. 20" wide x 15" deep x 35½" high. Back options available. Standard cubbie-tray colors are red, blue, yellow, green or orange. Mobile, caster mounted. Lifetime warranty - Birch Construction. Mobile storage for twenty-five cubbie-trays. 48" wide x 15" deep x 35½" high. Back options available. Standard cubbie-tray colors are red, blue, yellow, green or orange. Mobile, caster mounted Lifetime warranty. Designed to fit in tighter spaces. 38½" wide x 15" deep x 35½" high. Back options available. Standard cubbie-tray colors are red, blue, yellow, green or orange. Mobile, caster mounted Lifetime warranty. 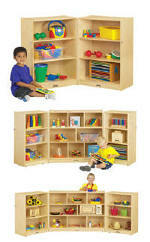 Tidy up any classroom with these cubbie units. Back options available. Standard cubbie-tray colors are red, blue, yellow, green or orange. Mobile, caster mounted. Lifetime warranty - Birch Construction. Rainbow Laminate available. Unassembled units available in Hardboard Back only with one year warranty - purchase trays separately. 20 Cubbie Unit - 48" wide x 15" deep x 29½" high. 25 Cubbie Unit - 48" wide x 15" deep x 35½" high. 30 Cubbie Unit - 57" wide x 15" deep x 35½" high. 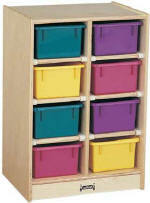 Tons of storage for individual students or classroom supplies. Papers (8½” x 11”) lay flat, without curled edges, in dishpan sized tubs. Back options available. Standard cubbie-tray colors are red, blue, yellow, green or orange. Mobile, caster mounted. Lifetime warranty - Birch Construction or Rainbow Laminate available. 20 Cubbie Unit - 60" wide x 15" deep x 29½" high. 25 Cubbie Unit - 60" wide x 15" deep x 35½" high. 30 Cubbie Unit - 60" wide x 15" deep x 42½" high. 24 TUB UNIT - Store twenty-four tubs in this four sectioned tower. Six tubs per section. 27" wide x 27" deep x 40½" high. 32 TUB UNIT - A four sectioned tower with eight tub cubbies in each. Room for thirty-two tubs. 27" wide x 27" deep x 53½" high. Standard cubbie-tray colors are red, blue, yellow, green or orange. Mobile, caster mounted. Lifetime warranty - Birch Construction. Tired of wrinkled paper? These efficient paper-tray cubbies are designed so 8½" x 11" sheets of paper lay without wrinkling. Great for assignments, art paper and computer centers. Back options available. Standard cubbie-tray colors are red, blue, yellow, green or orange. Mobile, caster mounted. Lifetime warranty - Birch Construction or Rainbow Laminate available. 12 Cubbie Unit - 24 1/2" wide x 15" deep x 35½" high. 24 Cubbie Unit - 48" wide x 15" deep x 35½" high. 30 Cubbie Unit - 60" wide x 15" deep x 35½" high. One central location for homework. 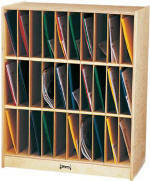 Twenty paper-trays and vertical slots for folders. 48” wide x 15” deep x 35½” high. 0416JC SECTIONAL MOBILE CUBBIE WITH TRAYS - INDICATE CLEAR OR COLORED. Holds fifteen trays and has sixteen removable, finished partitions. 48" wide x 15" deep x 35½" high. Back options available. Standard cubbie-tray colors are red, blue, yellow, green or orange. Mobile, caster mounted. Lifetime Warranty - Birch Construction. 0415TK - Hardwood Back only and one year warranty - purchase trays separately. Removable folder partitions and cubbie-trays for twenty students. 48" wide x 15" deep x 40" high. Back options available. Standard cubbie-tray colors are red, blue, yellow, green or orange. Mobile, caster mounted. Lifetime Warranty - Birch Construction. This mobile island provides double-sided storage and an E-Z to clean laminate worktop all in one. One side features three roomy shelves. The other side features two shelves and twelve cubbies. 48" wide x 29" deep x 29½" high. Standard cubbie-tray colors are red, blue, yellow, green or orange. Mobile, caster mounted. Lifetime Warranty - Birch Construction. Available in Rainbow Laminate also. Unassembed units - Hardwood Back only and one year warranty. Two cubbie tray cutouts and trays with lids allow tabletop art projects, experiments, or storage. E-Z to clean white laminate worktop. One side features ten optional cubbie trays and shelves. Seven shelves and four optional tubs are on the other side. 48½" wide x 29" deep x 29" high. Standard cubbie-tray colors are red, blue, yellow, green or orange. Mobile, caster mounted. Lifetime Warranty - Birch Construction. Fold the wings together and secure the lockable hasp. Each wing is 48" wide x 15" deep unit opens to eight feet. Super-sized units have three shelves. Back options available. Mobile, caster mounted. Lifetime warranty - Birch Construction or Rainbow Option (Shown). Unassembled Unit has hardwood back only and 1 year warranty. Designed for multiple use rooms where secured storage is needed. All units are 35 1/2"H by 15"D Hardwood Backs are standard. Back options available. Mobile, caster mounted. Lifetime warranty - Birch Construction. 0452JC Opens to four feet. Each wing is 24" wide. 0266JC - Center is 36½" wide. Each wing is 18" wide. Opens to 6½ feet. 0366JC - One of the largest storage units available. Opens to a full eight feet. Center section is 48" wide. Each wing is 24" wide. 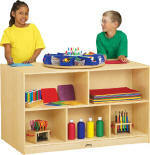 Arrange any classroom with this securable multi-purpose unit. Each section is 48" wide x 15" deep x 29½" high. Opens to eight feet. Hardwood Backs are standard. Back options available. Mobile, caster mounted. Lifetime warranty - Birch Construction. Generous storage at a child's height. Secure the hasp when needed. Each section is 48" wide x 15" deep x 35½" high. Opens to eight feet. Hardwood Backs are standard. Back options available. Mobile, caster mounted. Lifetime warranty - Birch Construction. Organization at it’s best. Twenty or Twenty-five cubbie-trays and generous locking shelving. Opens to eight feet. Each Hinged wing is 48" wide x 15" deep. 20 Tray unit is 29 1/2"H and 25 Tray unit is 35½" high. Hardwood Backs are standard. Back options available. Mobile, caster mounted. Lifetime warranty - Birch Construction. Classroom organization at everyone's fingertips. Wings can be "folded" and secured. Opens to eight feet. Center is 48" wide x 15" deep x 29½" high. Wings are 24" wide. Hardwood Backs are standard. Back options available. Mobile, caster mounted. Lifetime warranty - Birch Construction. Products are Shipped Freight Prepaid. Some Products are UPS Shippable.